The Rabbit and Ox compatibility has a lot of potential. It’s not a match made it heaven, but it’s not a match made in hell, either. The rabbit and the ox are two very different signs. The rabbit is the whimsical one of the two, while the ox is anything but. They are one of the most practical of the Chinese zodiac. In the ox the male or female rabbit will find the most dependable of soul mates, as this is a sign that can actually carry the world on its shoulders. The important thing is that the ox is happy to do so. This can serve the rabbit very well, in the day-to-day, financial matters and even in matters of the heart – if they are let in. They cannot promise much sympathy, as that is not its nature, but they will work hard to find a solution to whatever ails their partner. When the rabbit and ox are dating, The ox will end up grounding the rabbit, pulling them down from the clouds with its no-nonsense approach to the universe, which isn’t necessarily a bad thing. They will help their partner solidify plans and give them the backbone to make those dreams a reality. Yet they must be careful, as well. They are not the most tactful of the Chinese zodiac. And they can easily hurt the rabbit’s feelings, literally crushing it’s dreams with a few curt words. Of course the ox man or woman will probably not mean to be so brash, it’s just their nature. In a situation such as this, the rabbit man or woman may not want to show they are hurt, something that could cause problems later down the line. 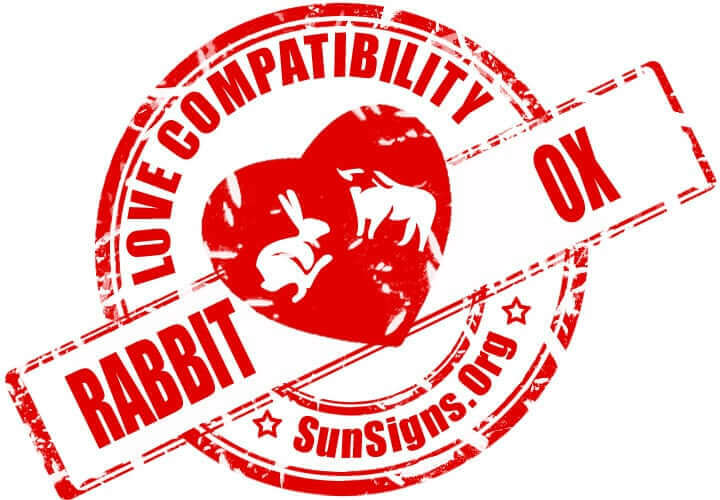 If this Rabbit and Ox compatibility does succeed in love, it will be a quiet one, with much time spent at home, in the company of only a close few friends. Luckily, although they will spend much time together at home, these two Chinese zodiac signs won’t be smothering each other. Each is independent in their own right, allowing the other to do what they please, without worrying too terribly much. In a rabbit and ox relationship, before making any commitment, they will want to be sure of each other’s feelings. This will be difficult for the rabbit, as it is perpetually afraid of making vows. The male or female ox will not entangle themselves with anyone without such affirmation. They demand complete loyalty from it’s partners. This might break up the rabbit-ox marriage before it even has the chance to get off the ground. Once committed, the ox will ensure a sturdy home and a steady supply of income. They will love to take care of things at home. They like to serve others – they need to, in a way. Their home will be quite comfortable since each views it as their own personal sanctuary. The difference lies in the fact that the rabbit likes to come home to its house to recuperate. The ox, on the other hand, never wants to leave. Complementing their partner’s practicality, the rabbit will provide the romance in the relationship. These are favors that they will have to accept that will not be returned, as romance is not part of the Chinese animal sign ox’s vocabulary. Romance to them is a good roof overhead and money in the bank. Overall the Chinese love compatibility between the rabbit and ox is excellent. But in bed, the rabbit might find the ox a little boring as they are not that sexually adventurous. But in friendship, they share a great bond. Rabbit & Ox Chinese Horoscope Compatibility Rated 5 Hearts!